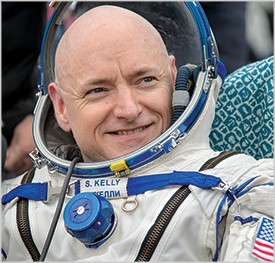 Saturday, Nov. 3; 7 p.m.
Over the course of four missions, astronaut Scott Kelly has seen things that few humans have—and he has documented the startling vastness of space in photographs. Drawing on his new book Infinite Wonder, Kelly discusses the challenges of long-term flight and reveals how seeing Earth from 250 miles above gave him a new appreciation of its beauty and its fragility. Thursday, Nov. 8; 6:45 p.m. Award-winning pastry chef, author and Virginia native Christina Tosi is the founding chef of Milk Bar, dubbed “one of the most exciting bakeries in the country” by Bon Appetit. Tosi, in conversation with Washington Post food reporter Tim Carman, will spend an evening at the Smithsonian devoted to the sugar-fueled, manically creative cake universe that she captures in her newest cookbook, Milk Bar: All About Cake. Following the program, the audience can sample treats from Milk Bar’s Logan Circle bakery. Tuesday, Nov. 13; 6:45 p.m. Structural biologist Venki Ramakrishnan examines the role of the once-elusive molecule ribosome in human genetics, and how he and his colleagues became the first to map its structure—an achievement recognized with a 2009 Nobel Prize in chemistry. Friday, Nov. 30; 6:45 p.m.
Steven Novella, producer and host of The Skeptics’ Guide to the Universe, and a posse of his fellow podcasters share how the powers of logic, science and skepticism can be the best weapons against superstition and pseudoscience. Drawing from their new book, The Skeptics’ Guide to the Universe: How to Know What’s Really Real in a World Increasingly Full of Fake, the skeptics examine the difference between science and pseudoscience, how to recognize common science news tropes and how to talk about conspiracy theories with that crazy coworker or friend. They also offer insights into how the brain works and strategies to avoid common pitfalls in thinking.